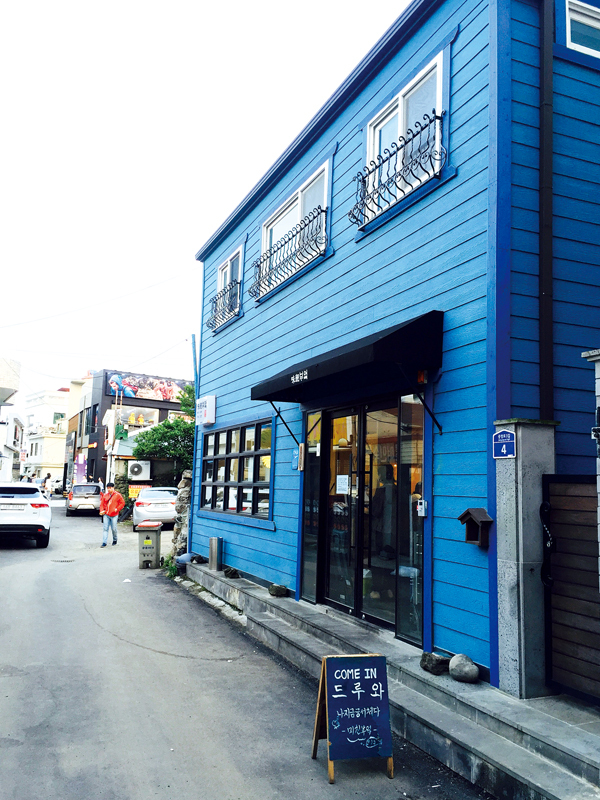 Down a small side street in Jeju City’s commercial waterfront area, just across the street from stores like Martro and Emart, you’ll find a small building painted a deep shade of cobalt blue. The first floor houses Crazy Kitchen, a restaurant that the owner was told he’d have to be nuts to open due to location, costs, and his menu ideas. He listened carefully to their proposal and agreed to their terms. Crazy Kitchen is insanely popular. I waited for about 30 minutes, hanging out on the plastic crates outside with a small crowd of other people who also couldn’t get a reservation. This restaurant is not spacious, nor is it calm or relaxed. There’s seating for maybe 30 people, some on the floor, most at tables, and a few at a small bar. It revels in madhouse ambiance, the kind you tend to find in heavy traffic eateries throughout Asia. The music, loud conversations, and brash decor all collude with a flurry of waitstaff and the blurred, fast-paced movements of the chefs behind the bar to give you that frenetic, exciting feeling that usually comes with exploring a new country for the first time. It’s definitely not for people who want a quiet, romantic evening of genteel dining. It is, however, where you want to go to put something offbeat and appetizing in your mouth. Omakas (omakase) is only available at the bar and you can reserve your seats for this Japanese culinary experience, which basically means “I’ll leave it up to you”. The chef prepares whatever they feel like and you eat it. This style usually focuses on sashimi (raw fish) or sushi (raw fish on bricks of rice), however the genre doesn’t exclude other cooking techniques. Champon is originally a noodle soup from Nagasaki, but it has grown in its many regional variations, so you can find expressions of this popular dish all over Asia. 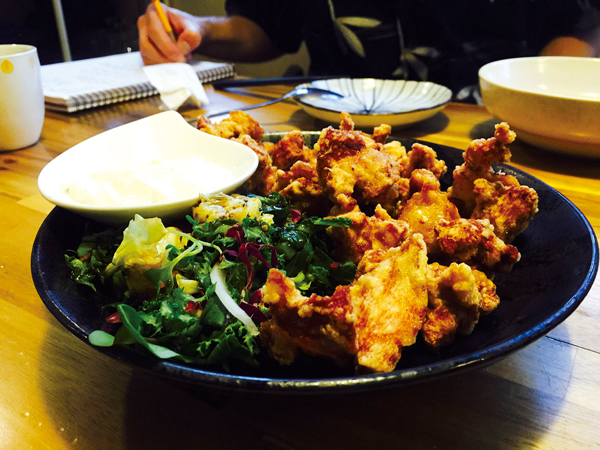 Karaage is a Japanese technique of deep fat frying small chunks of food - usually chicken. It's similar to tempura. Charshu (char siu) is originally a Cantonese style of preparing pork that has deeply penetrated the imagination and digestive tracts of satisfied eaters everywhere. 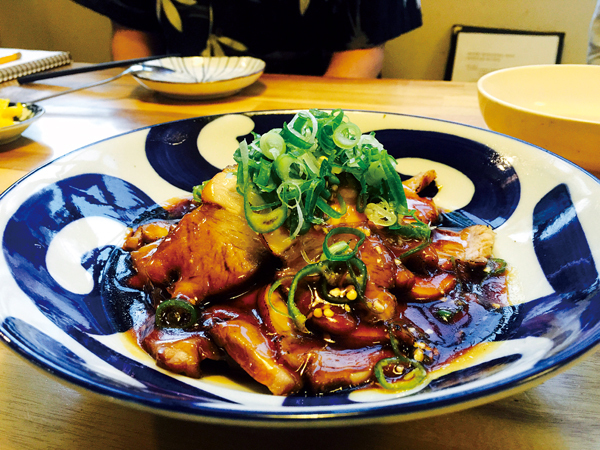 In my opinion, the Gong-oppa Charsu is Crazy Kitchen’s flagship dish. It reminded me a lot of some of the best pork dishes I enjoyed in China. The pig, which melts in your mouth, is piled on raw slices of onion, drowning in a succulent salty, sweet, slightly spicy brown sauce, and crowned with scallions. The karaage and tempura dishes were both good, but pretty mainstream. I liked the creamy dipping sauce that came with the crispy chunks of chicken, and the tempura also boasted a nice mix of shrimp, sweet potatoes, eggplant, and pumpkin - the fried shrimp heads were surprisingly good. The creamed champon was savory. It reminded me of a collision between New England clam chowder and Korean Jjamppong. It was creamy and white, not spicy at all, and it had a host of noodles, carrots, cabbage, squid, and mussels. The brisket and mungbean was the weakest dish I tried. It was a little too greasy, light on meat, and heavy on mung beans. It was okay, but not my favorite. The last dish was by far the most deranged: Chang Ran (or chang-ran) is spicy, aged, salted fish stomach and intestine cut into chewy little bits. It’s a Korean standard. 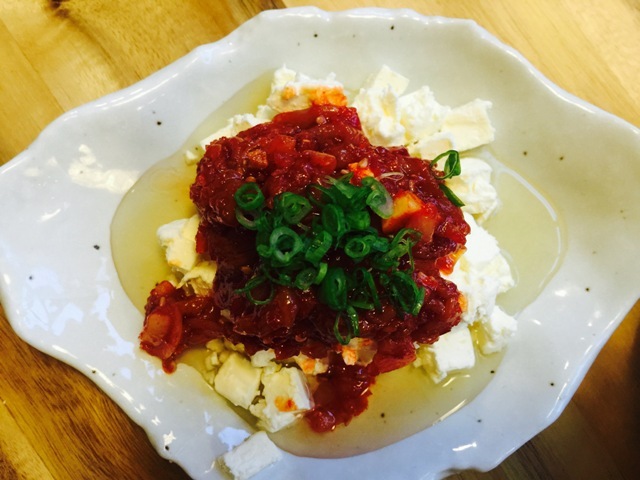 However, at Crazy kitchen they lay a half cup of chang-ran on small cubes of cream cheese in - wait for it - a pool of honey. Now, I’m almost certain that many of the people that just read that description are revolted by this combination. A few of you may well be questioning my mental competence. However, follow me down this rabbit hole, because it’s actually not bad. Is it scrumptious? No. However it is very distinctive, and I was shocked at how well these violently incompatible ingredients managed to combine in such a peaceful and palatable manner. All in all, Crazy Kitchen lives up to its name. It’s a reckless monument to experimental cooking and I applaud their temerity and skill. So much fusion cuisine in Korea ends up tasting like Korean food with a couple of “foreign” condiments and spices thrown it. This establishment is bold and unabashed, and while I didn’t find all their ideas to be completely successful, I did enjoy the experience, and I feel confident you will too. 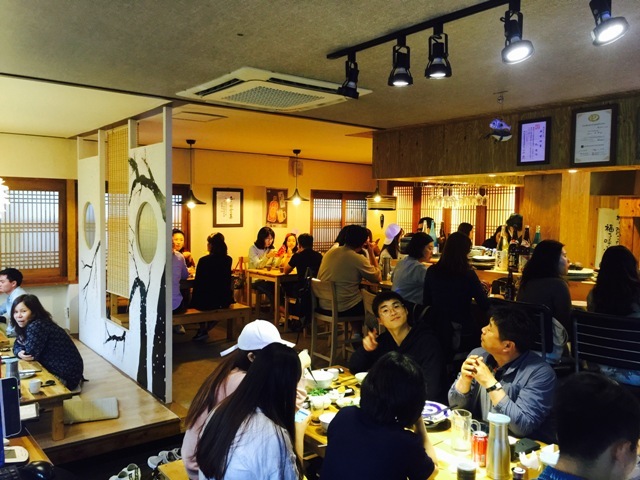 The menu runs from 5,000 to 45,000 won per dish, so expect to pay a bit of money when you go. There’s plenty to drink, but if you want to bring your own alcohol there’s a corking charge of between 10,000 and 20,000 won for wine, sake, or whisky. Arepa Grill: "It’s not a taco!"